Barack Obama presently has an 8-point lead in the Gallup tracking poll, and a 4-point lead in the Rasmussen tracking poll. These are pretty numbers for Democrats to look at, but since the polls were conducted in the middle of the Democratic convention, they require a bit of a haircut. In fact, our model is designed to tell us exactly how much that penalty should be. These polls consist of interviews that were conducted on Tuesday, Wednesday and Thursday -- so the median date of interviewing was Wednesday, corresponding with the third day of the Demcoratic convention. Our historial study of convention bounces tells us that, on the third day of the convention, the candidate will be experiencing an average bounce of about 3.5 points. So what we quite literally do is to subtract those 3.5 points from each of these polls -- meaning that Obama's 8-point lead in Gallup is equivalent to a non-convention lead of 4-5 points, and his 4-point lead in Rasmussen amounts to a virtual dead heat. Furthermore, the model expects that Obama's convention bounce should grow over the next couple of days, peaking at about 6 points in polls released over the weekend. So, he'll need to gain a little bit more ground to keep pace. My guess is that Obama will gain that ground, and probably will have some room to spare, but until we actually get a look at those numbers, we should probably regard this as a fairly ordinary convention bounce. 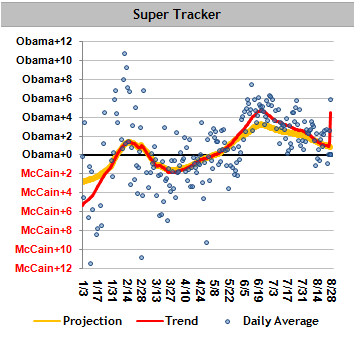 Please keep the convention bounce in mind when looking at the Super Tracker over the next couple of weeks. You'll see that there are going to be some fairly big difference between the red trendline -- representing our estimate of what would happen if the election were held today -- and the orange projection line -- representing our best estimate of what will happen in November. There is little doubt that Obama would win an election held today, perhaps in a relative blow-out, but so far, the organge projection line remains about where it had been before. For the most part, I'm going to let the state numbers speak for themselves until we've cleared some distance from the convention bounce period. The one interesting result is probably in Florida, where Mason-Dixon has Obama ahead by one point, perhaps reflecting the presence of Joe Biden on the ticket. Florida is a state where we expected Biden to play well. It's also a state, frankly, where I'd expect Sarah Palin to play poorly, since I think seniors will probably be her worst demographic. Since Mason-Dixon has generally had a slight GOP-leaning house effect, this poll needs to be taken pretty seriously.